By Daniel Horowitz--In an emotional celebration of UJA’s Annual Campaign held at the Sheraton Centre last night, close to 800 members of Toronto’s Jewish community came together to pay tribute to our community’s leaders, volunteers, and to hear from two important, and very different, Israeli voices. The evening’s featured speaker, Yossi Klein Halevi, a research fellow at the Shalom Hartman Institute, contributing editor to The New Republic, as well a frequent contributor to the op-ed pages of leading North American newspapers gave attendees some keen insights into the results of the recent Israeli national election, but not before sharing his feelings about Prime Minister Harper. “I’d like to start by offering my thanks to the Government of Canada,” said Halevi. The Chairs of UJA’s Annual Campaign 2013 are Sarena Koschitzky and Bruce Leboff, as well as the Chair of UJA’s Women’s Philanthropy, Laurie Sheff. “It is most fitting that this evening coincides with the celebration of Tu Bishvat last Shabbat,” Koschitzky told the crowd. “In any fundraising campaign, the real engine that drives success is the volunteer canvassing team, more than 600 strong,” said Leboff. “We have been fortunate to have very committed canvassers – they who share our commitment – and who gave generously of their most precious asset of all – their time. We have such committed donors. “The women in Toronto understand the importance of the campaign to all of us and have worked tirelessly to ensure that this year those who need our support will receive it,” said Sheff. 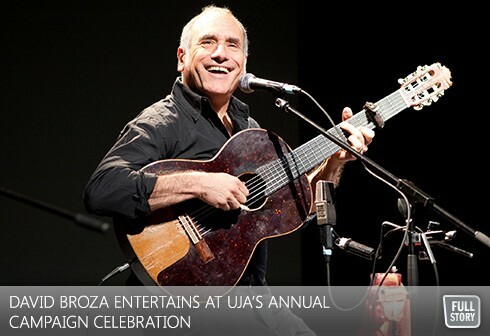 Then it was time for the evening’s main attraction, Israeli superstar singer/songwriter, David Broza, a native of Haifa. Broza wowed the crowd with his unique and passionate performance, and, later, in a memorable finale, the J-Roots Children’s Choir, a number of UJA’s Makom Young Israel Emissaries, and UJA Campaign leadership, joined Broza on stage for an emotional end to the evening.